If you have an international interest, but are majoring in another field, you may benefit from a minor in international studies. The minor is especially helpful if you are a student in modern languages, political science, journalism, education, or for anyone pursuing a career where a basic understanding of world affairs strengthens other program interests. Completion of the approved minor is certified on your official transcript upon graduation. If you are interested in careers in government, international organizations, business, teaching, or journalism you should contact the director of the international studies (IS) major. The major also provides sound preparation if you are interested in graduate work in law, the humanities, or the social sciences. Wright State grads with the IS degree are working in the private and public sector, in governmental and non-governmental organizations or using their B.A. in liberal arts as the foundation for law and other graduate degrees. They are working as foreign service officers for the U.S. Department of State; as community educators in the Peace Corps and in AmeriCorps, as research analysts at the United Nations Population Fund, in the U.S. Department of Homeland Security, the National Air and Space Intelligence Center (NASIC) and in other agencies at Wright Patterson Air Force Base. They are promoting human rights worldwide through the British charity Oxfam, at the United Nations, and with Médecins Sans Frontières; leading anti-human trafficking campaigns for the Polaris Project; assisting Darfuri refugees for Catholic Relief Services; and working as Congressional staffers…just to name a few. Kathryn Chaney weaves together her passion for travel, work experiences and two degrees from Wright State to thrive at the Defense Institute of Security Cooperation Studies. 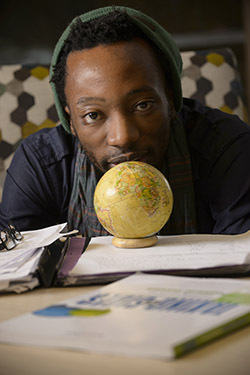 View the International Studies Minor degree requirements in the University Catalog. The International Studies program fosters life-long learning by providing you with the tools of language, critical thinking and analysis. The major prepares you to assume your role as an effective and informed global citizen while laying the groundwork for promoting international understanding. Each semester you choose from dozens of courses, drawn from across the university (the arts and humanities, the social sciences, the physical sciences, and business).